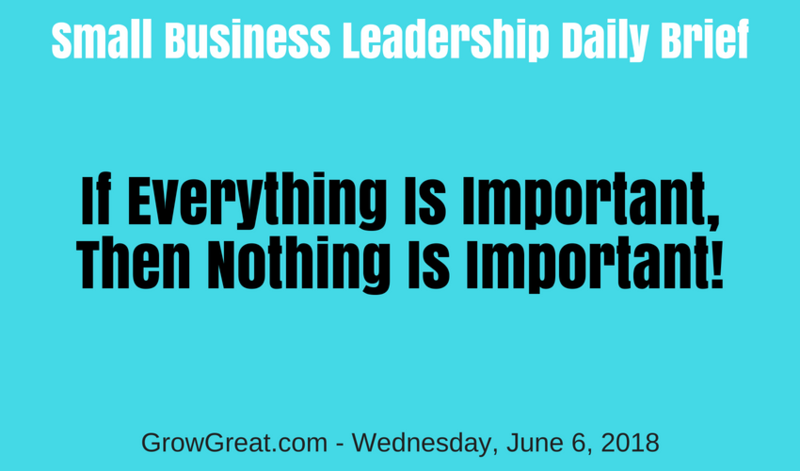 Small Business Leadership Daily Brief: June 6, 2018 – If Everything Is Important, Then Nothing Is Important! I first remember uttering this phrase as a teenager working for an autocratic, micromanager of a stereo shop who loved to preach, “Everything is important.” He would traipse around picking nits. Quite often we’d find ourselves doing things to appease him while other things that are far more critical went undone. For example, I remember working to connect some equipment in a sound room so we could avoid embarrassment when a shopper wanted to hear a certain setup. When you work in a retail environment that requires you to demonstrate something to a shopper, you want things to work as they should. I’d endured the ongoing embarrassment of a foiled demo because a co-worker would move or disconnect a piece of gear without letting the rest of us know (and without fixing what he broke). Almost daily the rest of us were frustrated, and we all knew the main culprit. As I’m taking care of that, the manager did an “all hands to the back” rampage session. We would file the owner’s manuals to the showroom gear in a file cabinet, alphabetically. Somebody had pulled one and left it laying on a box in the warehouse instead of filing it back where it belonged. This was almost never a problem. Mostly because shoppers rarely wanted to see one. This Tuesday news broke and the Internet is losing its mind over the White House rescinding an invitation to greet the President because a handful of players don’t want to go. I’m apolitical. That means I don’t care. You can judge me if you’d like. I’m a capitalist willing to assume responsibility for my own life. I’m thankful for our freedoms, but I don’t get wrapped around the axle about what goes on in D.C. (well, that’s not entirely true – Tuesday night I was disturbed that Vegas lost, again in the Stanley Cup Finals). Nearly everywhere I look online people are writing, judging, slamming or supporting what’s going on with an NFL team visiting the White House. And this impacts my life, or my business HOW? My life is made worse by this HOW? My life is improved by this HOW? It’s not. It doesn’t affect me one little bit. Unless I allow it. By being distracted from what really matters. Sorta like that manager who felt it more urgent for all hands to be lambasted instead of making sure our showroom was shopper ready! If everything is important, then nothing is important! Many managers, leaders and business owners love to preach their perceived truth that every detail matters. Perhaps. If you’re manufacturing aerospace parts it matters more than if you’re manufacturing beanies. I get it. When you tell your employees that everything is important then you’re telling them there are no priorities. How can there be if everything is equally important? But you don’t stop to realize that’s what you’re saying. And you’re not likely understanding how demoralizing it is to your people as they do their work. They know some things matter more than others. They understand some things are more critical than others. The more you beat them down with messages contrary to that truth – the worse it gets. Customer service and all other performance standards will erode. As you strain to emphasize everything being important, you’ll notice everything begins to fail. Set your own standards. Do you really care about your employees and customers? You should. If you do, then make the things that are important those things that most impact employees and customers. It’s not about refusing to look at lesser things (like an unfiled owner’s manual). It just means you can weigh if that’s a problem or not. A problem that requires some corrective action other than asking people to make sure they do it correctly next time. Stop trying to fix every problem with an immediate whack of a sledgehammer. If your employees can’t recite to you what’s most important in your business, then you’ve got serious work to do. Previous post: Small Business Leadership Daily Brief: June 5, 2018 – We Manage The Work. We Lead The People.